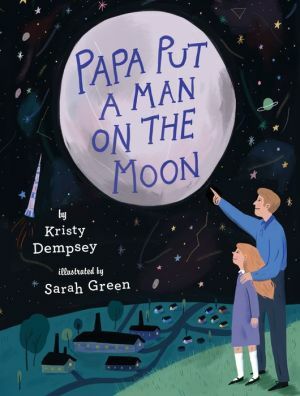 In time for the fiftieth anniversary of the moon landing, this father-daughter story celebrates a small community's big contribution to one of America's greatest accomplishments. Marthanne and her father sit side by side, looking out over their mill village as the moon glows in the sky. Marthanne hopes that one day, man will walk on the moon, and she knows her father is helping America accomplish this mission: The fabric he weaves forms one layer in the astronauts' spacesuits. Papa insists he's only making a living, but Marthanne knows his work is part of history, and she's proud. She tries to be patient, but she can't stop imagining the moon mission: the astronauts tumbling through space, the fabric her papa made traveling all the way up into the sky. When the astronauts blast off and Neil Armstrong finally takes his first steps on the moon, Marthanne watches in wonder. She knows her papa put a man on the moon.